Numerous prospective cohort studies have indicated that diabetes mellitus is associated with a three- to fourfold increase in risk for coronary heart disease (CHD) (1–3). The increase in risk is particularly evident in both younger age groups and in women. 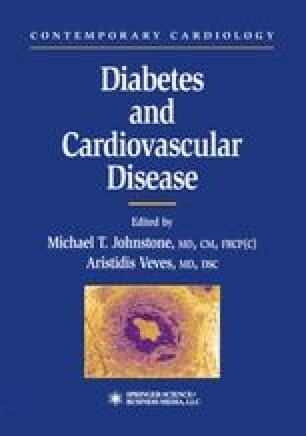 Women with type 2 diabetes appear to lose a great deal of the protection that characterizes nondiabetic females. Furthermore, patients with diabetes have a 50% greater in-hospital mortality and a twofold increased rate of death within 2 years of surviving a myocardial infarction. Overall, CHD is the leading cause of death in individuals with diabetes who are over the age of 35 years.